In a large saucepan or a soup pot, combine all the ingredients and mix together well. Bring to a boil over high heat; reduce heat and cook on low for an hour or until the vegetables are tender. 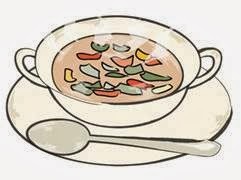 Note: If you want a “meat” soup, add 1 cup browned ground beef that has been drained or a cup of diced cooked chicken. Previous Green Chile Pesto and Roasted Chayote Squash Side Dish – Thanks, Rick!